My parking is being abused! What can I do to get control of my parking lot? This article will endeavor to answer this question, but only in compliance with private property impound laws in Oklahoma. I am the owner of a wrecker service. I’m most definitely NOT an attorney. I’m not licensed to practice law in this state or any other, and I don’t even play a lawyer on television. Everything not specifically quoted from State Law is only my opinion. This information is worth every penny you’re paying for it. Ok, that’s out of the way. Now, let’s talk about the State Laws that authorize and control Private Property Impounding in the State of Oklahoma. In addition to any procedure provided by local ordinance, whenever the owner or legal possessor of real property or an authorized agent has reasonable cause to believe that a vehicle has been abandoned thereon, said vehicle having been on said property for a minimum of forty-eight (48) hours, or whenever a vehicle is left upon said real property without express or implied permission, such vehicle may be removed as provided in this section. Looks like some definitions are in order. The abandonment part is quite clear. Once a car has been abandoned for 48 hours on any real property, the owner, lawful possessor, or their authorized agent can call any AA licensed wrecker service in that county and cause the vehicle to be removed and impounded. So what’s this stuff about express or implied permission? Let’s look at some definitions. If the legal definitions cause your eyes to glaze over, we won’t blame you if you scroll ahead to the summary at the bottom. Express permission is very clear, so that there can be no mistake about what is intended. Express permission means that you have been told that you have permission to engage in the activity in question. In the context of parking, your neighbor Joe is having a dinner party tonight. He’s expecting lots of guests. Joe asks you if it’s OK if he directs a few of his guests to park in your driveway, since you have extra space that you aren’t using. You answer that it’s fine, so long as you aren’t blocked from coming and going. This would be express permission. Implied permission, in the context of real property, means conduct or words or both that imply that an owner or occupant of land has agreed to another person’s use of or ability to enter land. In the context of parking, implied permission would mean that if you have a business with a parking lot, permission is implied for the public to enter your property and park a car without specifically asking, especially when such entry is for the purpose of doing business with the business in question. Implied permission dictates that unless constructive notice has been given that restricts the permission, the person driving the car generally has your permission to enter upon and park in your parking lot. OK, So How do I Remove This Implied Permission? Wait, so I have to just let anyone park in my business lot for up to 48 hours? Well, no. This is where signage comes in. The goal of signage is to NEGATE implied permission. The following language, when properly posted and visible from either all entrances or all spaces, would negate implied permission. There is no specific language required, and these examples are not the only wordings that can be utilized. OK, Are There Some Instances When I Don’t Need Signs? Yes. Any parking that endangers the safety of others, blocks legitimate access to trash dumpsters, marked fire lanes, driveways, or loading docks would not fit into implied permission. Vehicles parked on top of underground storage tank drops do not have implied permission, unless you’ve painted parking spaces there. Those vehicles can be towed immediately, even if no signs are present. Also, any person who you or your designated agent has told that they cannot park there, no longer has implied permission and can be towed at once. What about vehicles parked on your lot in order to advertise they’re for sale? It’s my opinion that implied permission to park a vehicle in a business parking lot includes only certain purposes. I don’t believe that a reasonable person would feel like permission to conduct used car advertising has been implied. If someone insists on using your $1.3 million high-exposure parking lot to get exposure for their amateur used car dealership, you should have their inventory removed from your business at their cost. So Who Can Order a Vehicle Removed? Let’s also look at the differences between “owner, lawful possessor, or their authorized agent”. The owner of real property is the person or corporation whose name is on the deed. A lawful possessor is a person who enjoys legal control of a property that they do not strictly own. This would be a tenant, in most cases. An authorized agent is any person (relative, friend, employee, etc) who the owner or lawful possessor has authorized to direct the removal of abandoned vehicles. So now I have to put big, ugly signs on my house? Does implied permission generally apply to residential property? My opinion is NO. No reasonable person would assume that it’s OK to just leave their car in another person’s private driveway, wouldn’t you agree? If I came home from work and my driveway was blocked by some random car, preventing me from accessing my garage, I would have that vehicle impounded immediately. However, apartment parking spaces are a little different. If you, the tenant, have specific marked spaces assigned to you in your lease, then you can have unauthorized vehicles towed from your space or spaces. You will need to present a copy of the lease, specifying the numbered spaces that are assigned to you. If you do not have a specific numbered space assigned in the lease, you’ll need to contact the apartment manager, not a wrecker service. 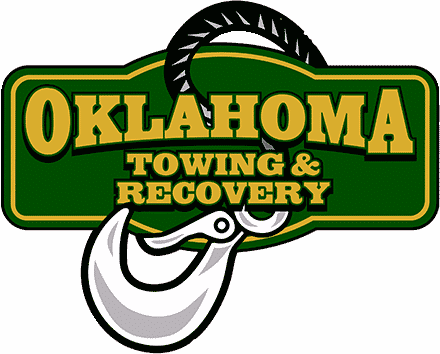 So, bottom line: It’s important to know private property impound laws in Oklahoma. 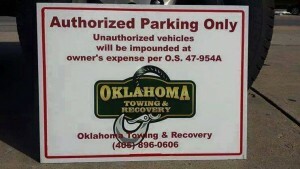 If you own, rent, or manage a parking area at a publicly accessible business located within the State of Oklahoma, and you don’t have signage that negates implied permission to park in your lot, then you cannot legally have vehicles removed until they meet the definition of abandoned (48 hours), unless the vehicle is disrupting access to necessary areas such as loading areas, fire lanes, driveways, or dumpsters. Also, any business can have any car towed that’s not displaying a handicapped parking placard or license plate while parked in a handicapped space. I also contend that those vehicles left in your lot with “For Sale” all over them do not have implied permission. Signs are not very expensive, and we can even help obtain and install them. With proper signage, you can have a vehicle removed as soon as you detect that the driver has parked on your lot, then left your property to visit another business or event. But even more important, effective signage will deter many drivers from abusing your parking. Regardless of any signage, if you find an unauthorized car parked in your assigned space at your apartment, you can have them towed…but ONLY if you show language in your lease that assigns you that specific parking space. Otherwise, you need to contact the apartment manager. Under private property impound laws in Oklahoma, vehicles parked on a public street can ONLY be ordered removed by law enforcement, even if it’s blocking your driveway. Call them if the car isn’t located on private property. If you are in Oklahoma County, we’d be happy to do a no charge site survey, then make suggestions. Our experience in parking solutions could save you time and money experimenting with ineffective efforts. We specialize in solutions! Call us today!